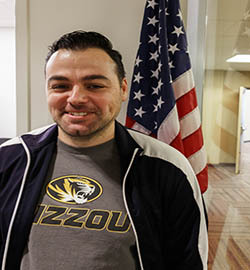 Advice you would give to other student veterans: Use the resources available to you. Don’t be afraid to ask questions of your fellow veterans or the vet center. Favorite Columbia hangout: When I first came to Columbia, the first place I went to with my wife was Shakespeare’s Pizza.